It’s Jerky Y’all will be donating 10% of all net profits to support Rowdy Girl Sanctuary! Why Wait ’til the Cows Come Home? All the protein in beef comes from the plants cows eat. That’s why we cut out the middle critter to put plant-based proteins into your belly right from the source. Yes, humans need foods to deliver nine essential amino acids our bodies can’t make for themselves. Guess what? Soy has ALL 9 amino acids plus a heaping helping of fiber, vitamins, minerals, antioxidants, and phytochemicals, too! Going meatless lets you skip saturated fats and cholesterol plus any hormones, antibiotics, bacteria, parasites, or carcinogens associated with animal proteins. Sweet! It’s Jerky Y’all uses the whole soybean — and only certified non-GMO soybeans — to deliver all that plant-based goodness to your body. We never use toxic chemicals to separate or mess with our soy in any way. Our plant-based jerky is clean, kind protein you can count on. I’m just happy as I know how to be that Rowdy Girl Sanctuary is on the receiving end of such a passionate organization as All Y’alls Foods and their It’s Jerky Y’all. We’ve all been very excited as the launch of the company got closer and closer. And now, here it is! Partnering with “It’s Jerky Y’all” is the perfect fit because we used to raise livestock and sell them at auction. Now we can enjoy the jerky without the cow! 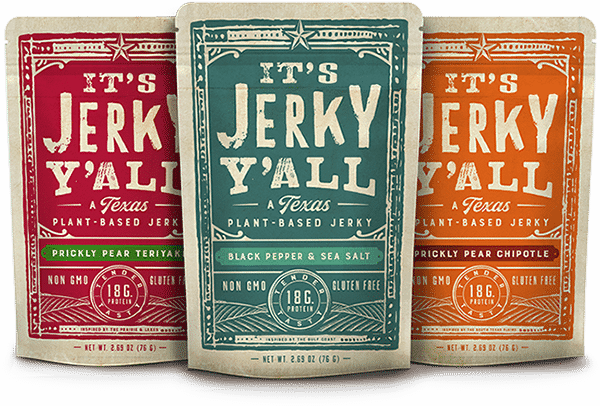 Learn more about It’s Jerky Y’all by visiting their web site.